The destination for my thanksgiving trip was a foregone conclusion given the fact that my wife is spending (more out of circumstances than any personal choice) the initial period of our married life pursuing her studies in Hawai'i while my life continues in Southern California. Having to choose from the half a dozen travel friendly islands, I picked the largest one, for no particular reason, as our official post marriage vacation. After a boring day long flight, I, along with my wife, (who happened to join me during my layover in Oahu) spent rest of the first evening searching for a campsite at the Hawai'i Volcanoes National Park. 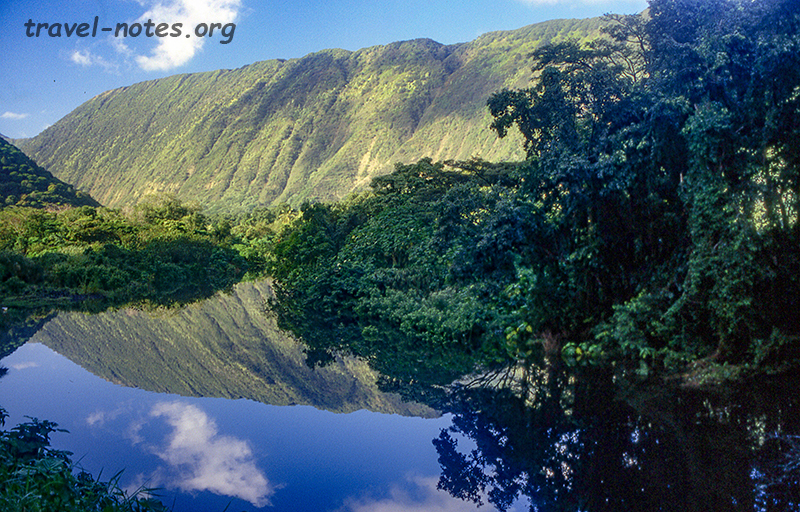 The park is located about 30 miles from Hilo, our landing point. Despite the new moon and the winter fog, we managed to finally locate the Kulanaokuaiki campground, one of the two camp sites in the Park. The following morning, to our great disappointment, we learnt that there was no lava flow in park, at least nothing that is reachable with a reasonable effort. 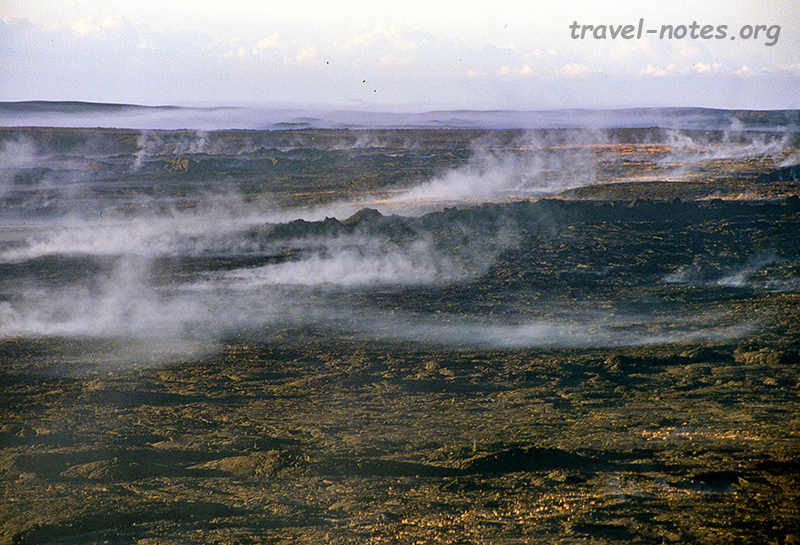 The Puu Oo volcano, the most active one in the park, had gone flat for the past three months. Luckily, the news turned out to be the only disappointment for the entire trip. We decided to spend the rest of the day driving around and day hiking in the park. Despite the lack of lava flow, the park still had enough to keep us occupied and interested for the day. The Thurston lava tube, especially the last unlighted section, Pu'u Huluhulu crater hike, Holei sea arch and the breathtaking Halema'uma'u crater are all definitely worth a visit. Our day was however cut short by the evening winter fog which seem to arrive in these parts with an unfailing regularity cutting the visibility to a few feet. Luckily, we had an early start and hence weren't too unhappy to retire early to our camp. Our next day started with a picture perfect sunrise over Kilauea crater before we drove off to Hilo. We spent the morning travelling the beaten path: Rainbow Falls, Peepee Falls, Peepeekeo scenic drive including the overpriced tourist trap of the tropical garden. The pick of the circuit was easily the stunning 420 ft Akaka falls, located about 15 mts north of Hilo. We had to rush through all these attractions in the morning in order to give us enough time to return to Hilo to join a tour group to go up Mauna Kea, the highest mountain in the Pacific. My altitude sickness and the state of the road had ruled out the possibility of us doing the trip all by ourselves. 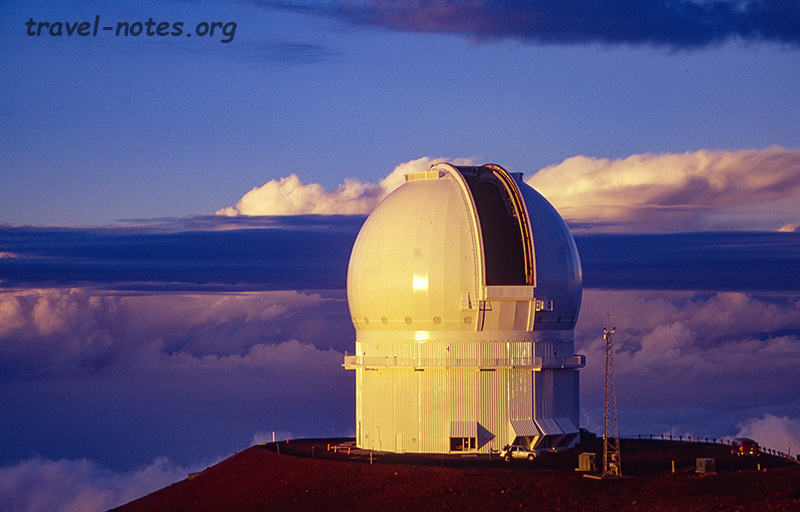 Mauna Kea is 13,796 ft high and houses the largest and most expensive collection of telescopes in the world. The weather here promises over 300 days of clear skies a year. The telescopes here along with their counter parts in Chile form the famous Gemini Observatories observing the entire universe, or at least the observable bit. Our guide, Kamaki, was extremely knowledgeable and went great length to ensure that we know about it. By the end of our trip we had more than enough knowledge about the history, politics, geography, geology, botany, climate, astronomy, and future of Hawai'i! As we went up the mountain we were transferred from a lush rain forest to lunar landscape within a matter of an hour. The change of landscape was so dramatic that I was not surprised to learn that Hawai'i has 21 of the 22 climatic regions available on the planet! When we reached the top we were greeted with blue skies, a welcome sight coming from a thick winter fog and we were in time to observe an amazing sunset. We also got a glimpse of the elusive the nearby Mauna Loa, which, by the way, is the largest mountain in the world, by volume. But the definite icing on the cake was obtaining a tour of one of the massive telescopes, James Clark Maxwell Telescope - world's largest sub millimeter telescope. Thanks to the high water vapour content in the atmosphere that evening, the telescope was rendered nonoperational and we got to meet a few scientists and see some newly born stars billions of light years away. The following day we drove to Kona along the northern route. We stopped at the Waipio valley and Pololu valley and Puukohola Heiau on the way. Waipio and Pololu valley trails (the latter being better of the two) offered some very pretty coastal scenery and also helped us break some sweat. Puukohola Heiau (Heiau, by the by is Hawaiian for temple) on the other hand, gave us an some introduction to Hawaiian history. Built by Kamehameha I, the great to please the war God, it is the site which saw him become the undisputed ruler of the islands when he managed to get his arch rival killed during the opening ceremony celebrations. On the last day, we visited the Puuhonua o Honaunau National Historical Site, a pretty sea side ruins of an old Hawaiian royal site. The park trail and the 1871 trail were both worth the detour and effort. 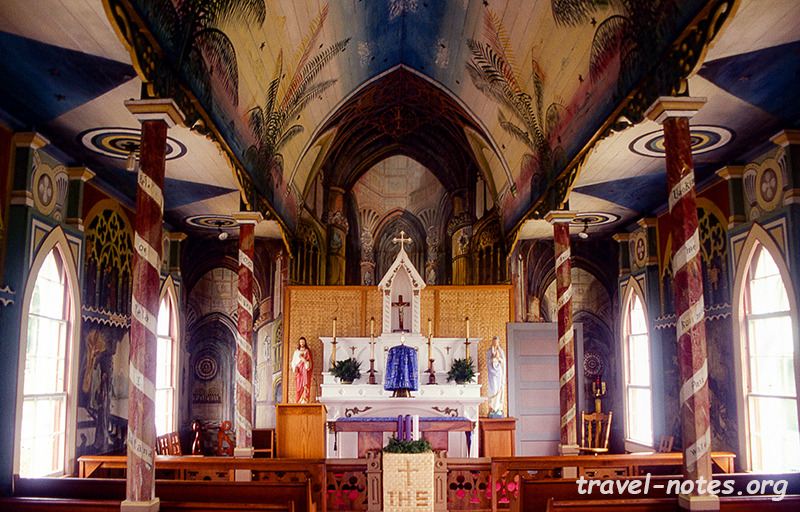 We also stopped by the St. Benedict's Painted Church on the way. As claimed by the guidebooks, the paintings definitely made the church look much larger than its actual size. 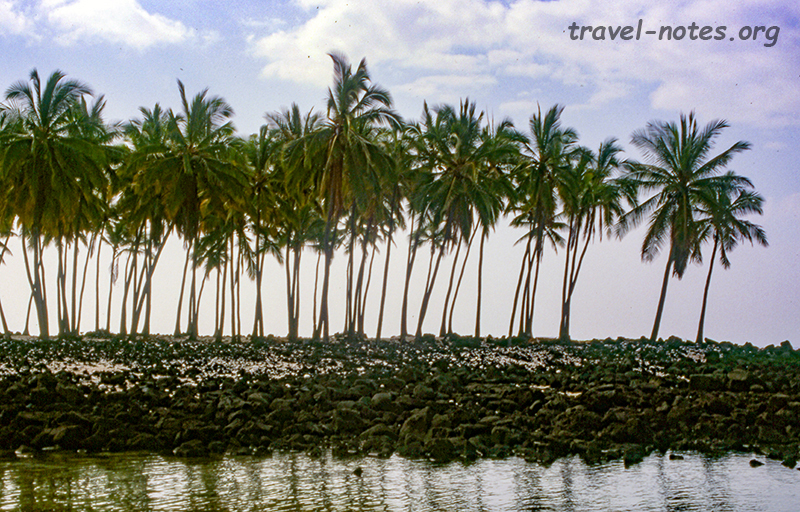 We had enough time left in the day to drive to Hilo by the southern route stopping by the famous Punaluu black sand beach, where surprisingly we had enough luck left with us to sight a green sea turtle lazing on the beach. Click here for more photos from the Big Island, Hawai'i.